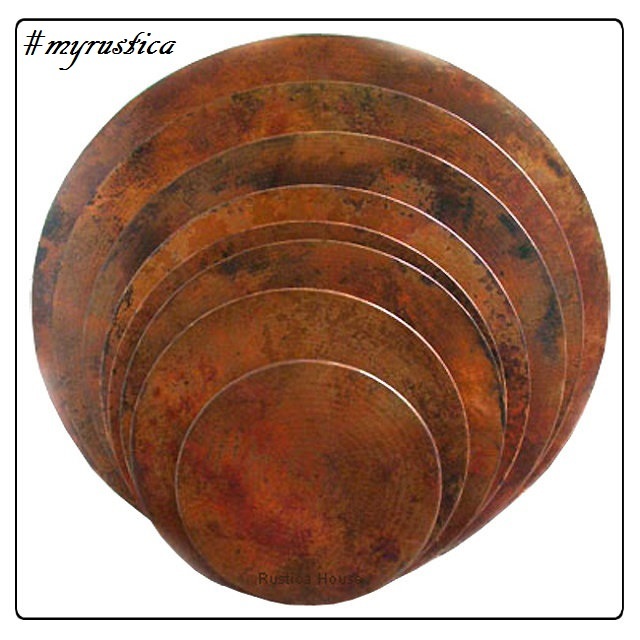 Rustica House copper table-tops are hand crafted in many shapes, colors and styles. The most popular tabletops are round and square. Both of them come in various predefined sizes or made to order. We produce copper tabletops in Santa Clara del Cobre as small as 12 inches in diameter. There is no limit on the upper size but there might be some limitations because of the shipping restrictions. We recommend ordering very large copper table-tops eighty inches and up in two or four sections that can be assembled together once delivered. Copper table-tops are handmade using particle board covered with copper sheeting. For commercial use such as restaurants and bars we use thick plywood instead. All hammered copper for kitchen, dining and bathroom is made of 99.9% recycled pure metal. Buy any copper table-top model in natural, honey, antique or coffee patina. Natural is the most rustic perfectly suited for traditional home decors. Honey finish is uniform and antique looks old. Alternatively, copper table-tops can be polished to shining look. Production and delivery is about four weeks. Round Copper Tabletop "Light Patina"